a 14 percent increase in traffic fatalities over the past two years — the largest two year increase in more than 50 years. Does Alabama have a law aimed at distracted driving? Yes. Alabama does have a (limited) distracted driving law. In 2012, Alabama passed legislation banning texting and driving. The Alabama statute applies to devices that are removable from the vehicle and “write, send, or read text or data through manual input.” The law makes it illegal to use these devices to communicate by manual text-based communications while driving. Basically, the law applies to texting or other typing and reading activities (like typing data into a GPS system) while driving. In Alabama, law enforcement officers can issue a primary citation for violations. That is, you can be pulled over just for breaking this law. The police officer does not need another reason (like speeding) to stop you. Yet, the penalties are weak. A driver caught texting can only receive a $25 fine for the first violation. If you have ever paid a speeding ticket, you know those fines are much greater. Current Alabama law does not apply to many types of distracted driving. In the last couple years, we have seen many reports of deadly accidents caused by drivers distracted from other non-texting activities like watching YouTube, using Facebook, or surfing the Internet while driving. A couple years ago, we even represented a personal injury victim hurt by a person watching a movie while driving. I am realistic. Our law can never encompass all the potential bad behaviors in society. However, we should make an effort to keep our laws current with the behaviors endangering families on the highway. And, portable devices have advanced far beyond simply texting. Current Alabama law does not contain sufficient penalties. A $25 fine? Really. In our personal injury practice, we repeatedly see terrible car crashes caused by distracted drivers. It is a huge safety issue. And, it is an issue of complete driver choice. With texting devices, drivers can choose to turn the device off or put it away before starting the car. Such a small fine is unlikely to have any impact on driver behavior. 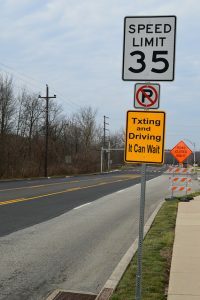 Even though most states have put in place laws that restrict texting while driving, more action is needed to address distracted driving and the sharp spike in crashes and traffic fatalities that have occurred over the past few years. In 2017, several other state legislatures acted to strengthen their distracted driving laws. Both Washington and Arkansas expanded the definition of distracted driving in an effort to include driver distractions such as Facebook and YouTube. Washington, Arkansas, North Dakota and the District of Columbia increased fines for violators. Colorado passed legislation increasing its fines which is currently sitting on the governor’s desk awaiting signature. In Arkansas, first-time offender fines are now up to $250. Repeat violations are even greater. Some of these provisions also increase fines for offenders involved in accidents. In addition, Tennessee and Vermont passed laws banning the use of handheld devices in school zones. At our firm, we have handled several distracted driving cases where the crash occurred in a school zone. Last year, we completed a case where a young student slammed into another vehicle in a school zone while looking for songs on her phone. That crash destroyed two vehicles and left one victim with a traumatic brain injury. We recognize that simply passing new laws will not stop dangerous distracted driving. That’s why we continue to advocate an approach involving law enforcement, education and technology. The danger of distracted driving puts our families at risk on the highway. I worry every day about my own children being hurt by a distracted driver. We must continue to advocate for highway safety that protects our families as they travel to school, work and errands each day.